Blotchy stains and winter ice crystals indicate ventilation and air leakage problems that can rot your roof. Mold usually indicates a moisture problem. Mold in any indoor space usually means that too much moisture is present. If you don’t detect the moisture source and correct the problem, it’s certain to continue and get worse. Icy evidence. In the winter, warm, moist air that leaks into the attic will condense on rafters and roof sheathing, resulting in wet wood that can turn into an icy coating. Mold and wood rot will follow if air leaks aren’t sealed. 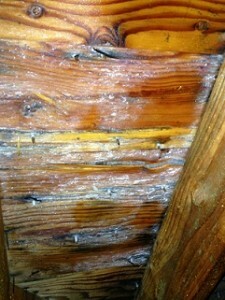 Attic mold can develop into wood rot. Mold that lives on a wood surface can eventually encourage the growth of another fungus that will rot and weaken important structural elements like rafters and roof sheathing. Airborne mold spores pose a health hazard. Mold reproduces by means of airborne spores. Exposure to these microscopic organisms (either by skin contact or inhalation) can cause a wide range of allergic reactions and respiratory ailments. 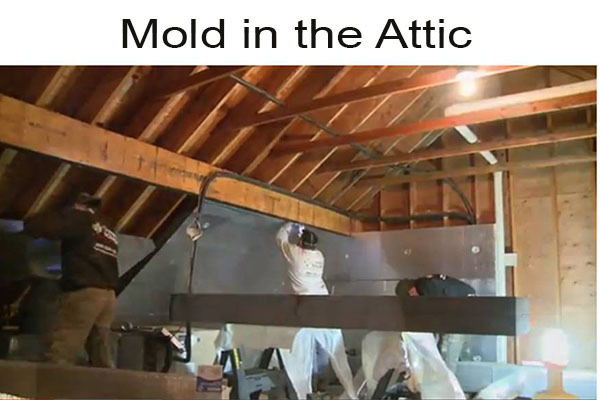 Attic mold can be a sign of ventilation and air leakage problems. If you’ve ruled out roof leakage as the source of attic moisture, there’s a good chance that air leaks or improper ventilation are bringing moisture into the attic. Both of these problems should be corrected. If a roof leak isn’t the source of unwanted attic moisture, you can be fairly certain that air leaks and/or ventilation problems are responsible for the mold. A common ventilation error is to allow clothes driers, bathroom vent fans and kitchen vent fans to blow moist air into the attic instead of to the outdoors. As soon as this warm, moist air hits cooler attic surfaces, water condenses on rafters, floor joists roof sheathing. Mold is likely to take hold here because damp wood in a dark space provides an ideal habitat. Fortunately, this ventilation error can be corrected by ducting these appliances to the exterior. Bath fan blunder. The duct for a bathroom fan should be connected to a vent hood that moves moist bathroom air outdoors. Dumping the air into the attic, as shown here, will result in wet roof sheathing that’s develops a telltale black mold stain. Air sealing the “pressure barrier” between your living space and the attic is another way to discourage mold growth in the attic. There are many cracks and gaps that provide pathways for warm, moist air to escape into the attic during cooler weather when convection forces warmer air to rise. For example, recessed “can” lights that extend into the attic and drop-down attic stairways are common leak areas. There’s good general information about attic air sealing in this Dr. Energy Saver video. 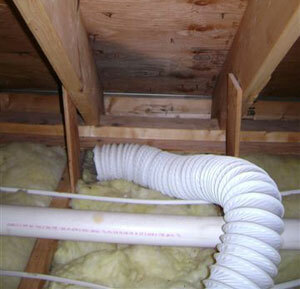 You’ll also find some useful how-to information about attic air sealing in this Family Handyman article. Most homeowners elect to hire a home energy upgrade specialist for attic air sealing because of the different products and techniques that are required. Also, cramped attic spaces can be challenging for an inexperienced worker. The good news about this attic mold prevention work is that it also provides you with major energy-efficiency benefits. Attic air sealing, combined with an attic insulation upgrade, can cut your heating and cooling expenses by 40%.